Butter is a soft, yellow-hued, edible emulsion of butterfat, water, air, and sometimes salt. It is made from the churning of cream and is used as a spread as well as an important ingredient in cooking and baking. Margarine is an inexpensive alternate to butter, made from oil or a combination of oils through the process of hydrogenation. Many people prefer margarine over butter because it is lower in fat and cholesterol than butter. References to butter date back to as early as the ninth century B.C. in India, but its “invention” is credited to the nomadic tribes of Asia around 3500 B.C. , although the first batch probably came about by accident. It is assumed that when the people of these tribes strapped bags containing milk onto their persons or saddles as nourishment for a journey, the resulting motion of the ride churned the milk. If the weather was cold enough, a bit of fat rose to the top of the bag and the result came to be butter. On the other hand, if the weather was too warn, the result was what came to be cheese. The use of butter eventually spread westward when these Asian peoples invaded the lands of the Near East and Europe. Eventually, butter began to be manufactured in vertical churns by other developed civilizations. A picture of a primitive churn is evident in a Sumerian bas-relief dating from around 3500 B.C. One of the first written references to the substance comes from India in the form of a ninth-century etiquette manual. It suggested that Hindu brides be given milk, honey, and butter on the day of their wedding. The manuscript also mentioned greasing the wheel of the bridal carriage with butter to insure a trouble-free marriage. Because the cow is regarded as a sacred animal in Hindu religion, butter has long played an important role in Indian cuisine, and is mentioned specifically in religious tracts. In neighboring Tibet, butter made from the milk of yak was sometimes smeared on religious statues. Soon butter became common to cultures that relied on the domesticated cow for sustenance, but it could also be made from the milk of sheep and goats. Although Greeks and Romans were not fond of rich, dairy-based foods, the word “butter” is derived from the Greek term buturon, meaning “cow’s cheese.” The term later found its way into Latin as butyrum. Celts and later the Vikings eventually became devotees of the substance, and by the late Middle Ages it was a staple in the diets of many Europeans and a valued trading commodity. The dairy product has also been considered a mystical salve during certain periods of history. For centuries, the people of Brittany placed butter near a person suffering from cancer to absorb the disease. These illustrations show the commercial manufacture of margarine. Guidelines for margarine production dictate that margarine contain at least 80% fat. The oils used in the production can be derived from a variety of animal and vegetable sources. Its aqueous content may be milk, water, or a soybased protein fluid. caused leprosy. The dairy product eventually became a prohibited item for fast days as decreed by the Roman Catholic Church, although a dispensation could be purchased for those who simply could not go without it. In Rouen, France, legend has it that a “butter tower” was financed solely by such dispensations granted for eating butter on fast days. Butter manufacturing in the U.S. dates from the time of the first colonists who brought cows with them to North America. Families who owned their own cows usually made butter themselves. Milk from the cow was left alone until its cream rose to the top. The cream was then skimmed off and left to cool, and the temperature was raised to about 70°F (21°C) a day before the buttermaking process was to begin. Heating the cream ripened it, and it was then cooled several degrees. Next, the cream was placed in a wooden device, sometimes barrel-shaped or otherwise cylindrical, and mixed with the help of a paddle. This process generally took at least 30 minutes. The leftover cream in the churn was buttermilk. If the cows were eating grass, the butter possessed a yellowish cast, but during winter, when they were getting other types of feed, it was white. The butter was then rinsed with cool water, “worked over” a bit more, then salted for taste. The continuous-How process is the most commonly used method in the manufacture of margarine. If milk is used as the liquid base, it is joined with salt and an emulsifying agent in a chamber. An emulsifier works by decreasing the surface tension between the oil globules and the liquid mixture, thereby helping them form chemical bonds more easily. The result is a substance that is neither wholly liquid nor wholly solid. affordable alternative. Hippolyte Mege-Mouriez won the 1869 competition for the item he named margarine after its primary ingredient, margaric acid. The margaric acid had only recently been discovered in 1813 by Michael Eugene Chevreul and derived its name from the Greek term for pearls, margarite, because of the milky drops that Chevreul noticed in his invention. In modern times it is manufactured from an oil or combination of oils through the process of hydro-genation, a method perfected around 1910. This process helps animal or vegetable oils emulsify, or turn from a liquid substance into a fatty one of a semi-solid state. Since the 1930s, the Votator has been the most commonly used apparatus in U.S. margarine manufacturing. In the Votator, the margarine emulsion is cooled and occasionally agitated to form semi-solid margarine. has become a nearly interchangeable substitute for butter and provides less fat and cholesterol than butter at a lower cost. Butter is made from dairy milk and salt. Margarine, on the other hand, can be made from a variety of substances. The first of these is any edible animal or vegetable oil such as corn oil or sunflower oil. Its liquid component can be made from milk, water, or sometimes a liquid protein mixture derived from soybean. 1 For many years the major creameries for butter manufacturing were located in the states of the Eastern seaboard, but the flourishing of a more industrialized agriculture in the Midwest led to the predominance of butter-making facilities there. The modern butter-making process begins when fresh cow’s milk from dairy farms is brought into the facility. The product is inspected, classified into different groups according to its adjudged quality, and then filtered to remove impurities. Then the milk is separated by means of centrifugal force. It is pumped into a large, cylindrical, vertical rotator device. When turned on, this rotator spins the liquid until the cream rises to the top. The cream is then fed into large stainless steel vats or heat exchangers and heated to 180°F (82°C) for about 30 minutes in the pasteurization process to remove any lingering bacteria. The pasteurized cream is then cooled. 2 The cream is placed in a large, mechanical churn usually made of aluminum. Some of these industrial-sized churns can make 1,500-5,000 pounds (681-2270 kg) of butter at a time. When the churn is activated, it tumbles the cream, much like the motion of a clothes dryer, while a worker watches the process through a small glass window on the churn. After about 45 minutes, small granules of butter begin to form, and the butter and buttermilk are separated. Salt is added, and the mixture is churned further. When this process is completed, a stainless steel mobile device sometimes called a “boat” is placed adjacent to the opening of the mechanical churn. The door of the churn is opened, and the butter begins to spill out into the boat; activating the churn removes the rest. It is then wrapped into 64-pound (29 kg) cartons and sent to the distributor. There, the butter is repackaged for consumer and food-service industry use. Margarine can be made from a variety of animal fats and was once predominantly manufactured from beef fat and called oleo-margarine. Unlike butter, it can be packaged into a variety of consistencies, including liquid. No matter what the form, however, margarine must meet strict government content standards because it is a food item which government analysts and nutritionists consider to be easily confused with butter. These guidelines dictate that margarine be at least 80% fat, derived from animal or vegetable oils, or sometimes a blend of the two. Around 17-18.5% of the margarine is liquid, derived from either pasteurized skim milk, water, or soybean protein fluid. A slight percentage (1-3%) is salt added for flavor, but in the interest of dietary health some margarine is made and labeled saltfree. It must contain at least 15,000 units (from the U.S. Pharmacopeia standards) of vitamin A per pound. Other ingredients may be added to preserve shelf life. 1 When the ingredients arrive at the margarine manufacturing facility, they must first undergo a series of preparatory measures. The oil—safflower, corn, or soybean, among other types—is treated with a caustic soda solution to remove unnecessary components known as free fatty acids. The oil is then washed by mixing it with hot water, separating it, and leaving it to dry under a vacuum. Next, the oil is sometimes bleached with a mixture of bleaching earth and charcoal in another vacuum chamber. The bleaching earth and charcoal absorb any unwanted colorants, and are then filtered out from the oil. Whatever liquid is used in the manufacturing process—milk, water, or a soy-based substance—it too must undergo preparatory measures. It also undergoes pasteurization to remove impurities, and if dry milk powder is used, it must be checked for bacteria and other contaminants. 2 The oil is then hydrogenated to ensure the correct consistency for margarine production, a state referred to as “plastic” or semi-solid. 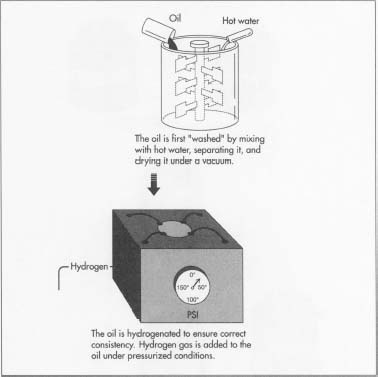 In this process, hydrogen gas is added to the oil under pressurized conditions. The hydrogen particles stay with the oil, helping to increase the temperature point at which it will melt and to make the oil less susceptible to contamination through oxidation. 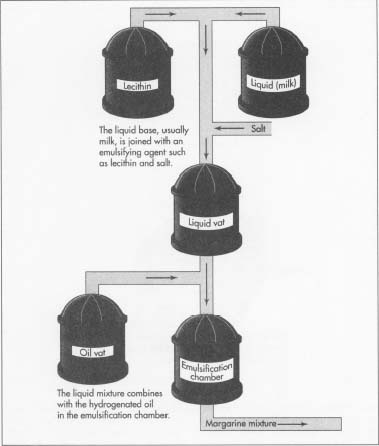 The continuous-flow process is the most commonly used method in the manufacture of margarine. If milk is used as the liquid base, it is joined with salt and an emulsifying agent in a chamber. The emulsifying agent ensures that the emulsification process—chemically defined as a suspension of small globules of one liquid in a second liquid—takes place. An emulsifier works by decreasing the surface tension between the oil globules and the liquid mixture, thereby helping them form chemical bonds more easily. The result is a substance that is neither wholly liquid nor wholly solid but rather a combination of the two called semi-solid. Lecithin, a natural fat derived from egg yolk, soybean, or corn, is one typical emulsification agent used in margarine manufacturing. 3 In the initial step, the liquid, salt, and lecithin are mixed together into one tank opposite another vat holding the oils and oil-soluble ingredients. In the continuous-flow process, the contents of the two vats are fed on a timed basis into a third tank, typically called the emulsification chamber. While the blending process is taking place, the equipment’s sensors and regulating devices keep the mixture’s temperature near 100°F (38°C). 4 Next, the margarine mixture is sent to a device called a Votator, the brand name for the most commonly used apparatus in U.S. margarine manufacturing. It has been standard equipment to the industry since the 1930s. In the Votator, the margarine emulsion is cooled in what is referred to as Chamber A. Chamber A is divided into a trio of tubes that successively decrease its temperature. Within two minutes the mixture has reached 45-50°F (7-10°C). It is then pumped into a second vat called Chamber B. There it is occasionally agitated but generally left to sit still and form its semi-solid state. If it needs to be whipped or otherwise prepared for special consistency, the agitation is done in Chamber B. Quality control is an obvious concern at modern food-processing facilities. Unclean equipment and shoddy methodology can lead to a mass bacterial contamination that could disrupt the stomachs and even lives of thousands of consumers within a matter of days. The U.S. government, under the auspices of the Department of Agriculture, maintain specific industrial hygiene codes for modern creameries and margarine manufacturing plants. Inspections and fines for poorly maintained equipment or unclean conditions help keep companies in compliance. Butter is graded by USDA inspectors at the creamery. They inspect each batch, test it, taste it, and assign a score to it. They give a maximum of 45 points for flavor, 25 for body and texture, 15 points for color, 10 for salt content, and 5 for packaging. Thus, a perfect batch of butter can receive a score of 100 points, but usually the highest number assigned to a package is 93. At 93, butter is classified and labeled Grade AA; a batch that receives a score below 90 is considered inferior. Guidelines for margarine production dictate that margarine contain at least 80% fat. The oils used in the production can be derived from a variety of animal and vegetable sources but all must be fit for human consumption. Its aqueous content may be milk, water, or a soy-based protein fluid. It must be pasteurized and contain at least 15,000 units of vitamin A. It may also contain a salt substitute, sweeteners, fatty emulsifiers, preservatives, vitamin D, and coloring agents.